What’s the difference between corned beef and pastrami? Did the Brits invent London Broil? What about French Dip? Though there are more varieties, preparation methods and cuts that we can likely count, one thing is for sure –we love our beef. Come explore with us the nuances of what makes these favorites unique and so very flavorful. Welcome to Beef 101. Corned Beef or Pastrami? Ask someone to explain the difference and your question will likely be returned with a quizzical stare. Sure, just about everyone knows that you eat corned beef on St. Patrick’s Day, or layer it between toasted bread with sauerkraut and Thousand Island dressing and call it a Reuben. Pastrami on rye with mustard is about as classic as it gets at the neighborhood delicatessen that’s been a local institution since before you were born. And though they do have much in common, there are many differences both how they came to be and their uniquely delicious flavors. Both corned beef and pastrami are salt cured meats, something that became extremely popular during the world wars when fresh meat was rationed and very hard to come by. In fact, corned beef is said to have gotten its name from the large grain rock salt, called corns, used to cure it. Pastrami’s name can be traced back to the Romanians, who got it from the Greeks, who borrowed it from the Turks. Though despite its multicultural beginnings, it was a New York City Kosher butcher who is rumored to have served the first pastrami sandwich in the US way back in 1887. Both come from cows, but are different cuts of meat. Corned beef is typically brisket and pastrami often comes from the navel which sits next to the brisket, closer to the belly. The biggest difference between them lies in how they’re cooked after curing. Corned beef is boiled, while pastrami is smoked. 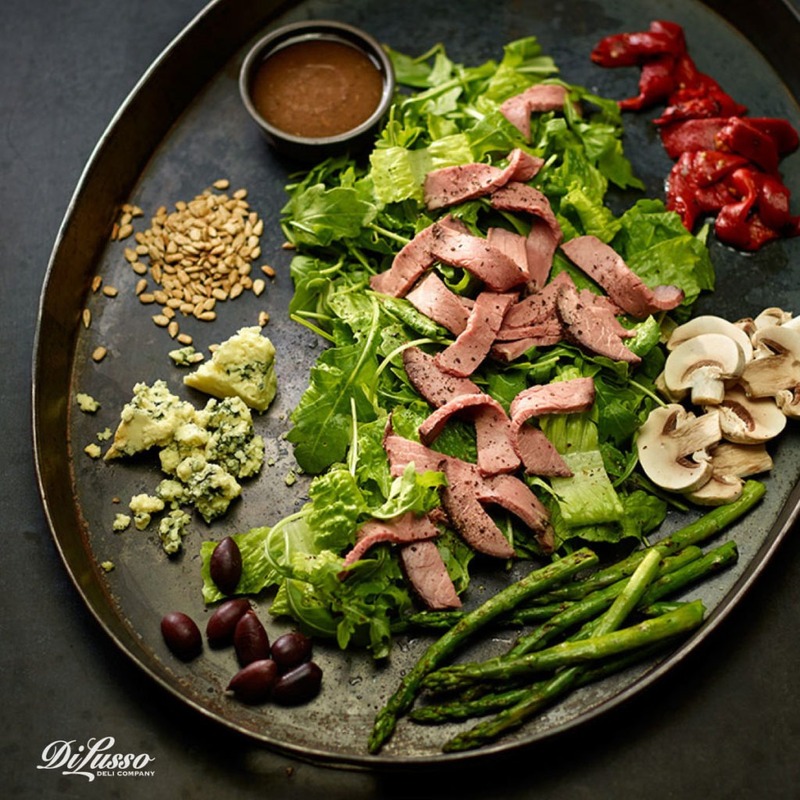 DI LUSSO® Pastrami is cured and rubbed with a black peppercorn spice mix for a bold and flavorful bite. It’s hard to beat a classic - DI LUSSO® Pastrami and Deli Style Mustard on marble rye. But this flavorful beef is incredibly versatile and can add an accent of flavor and color to so many dishes. 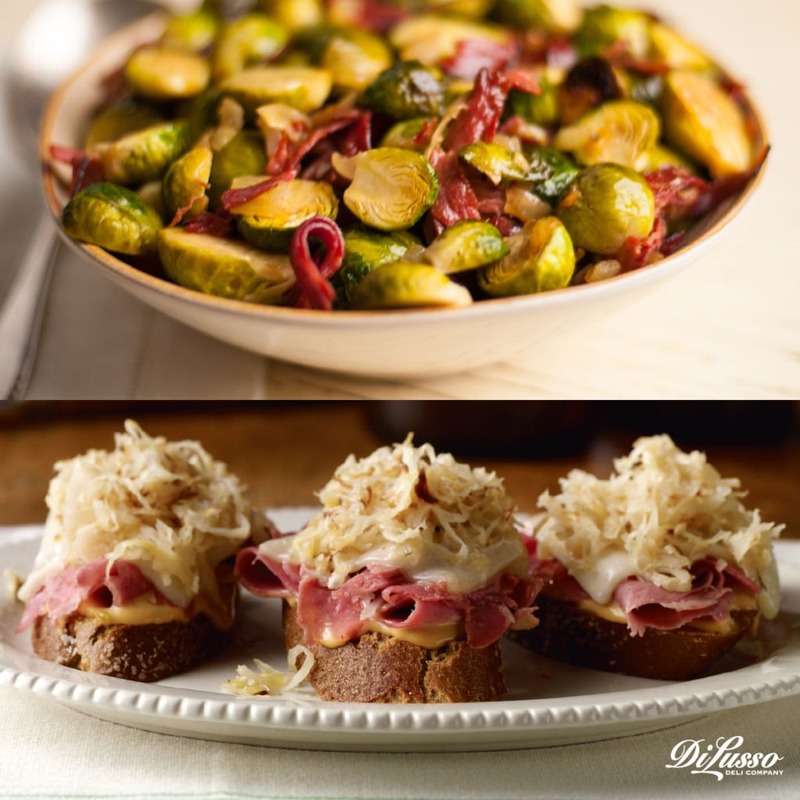 With Thanksgiving upon us, we’re always on the lookout for sensational sides to share, like this Brussel Sprouts with Pastrami. Our Corned Beef is cured in the traditional style and flavored with an authentic blend of spices. 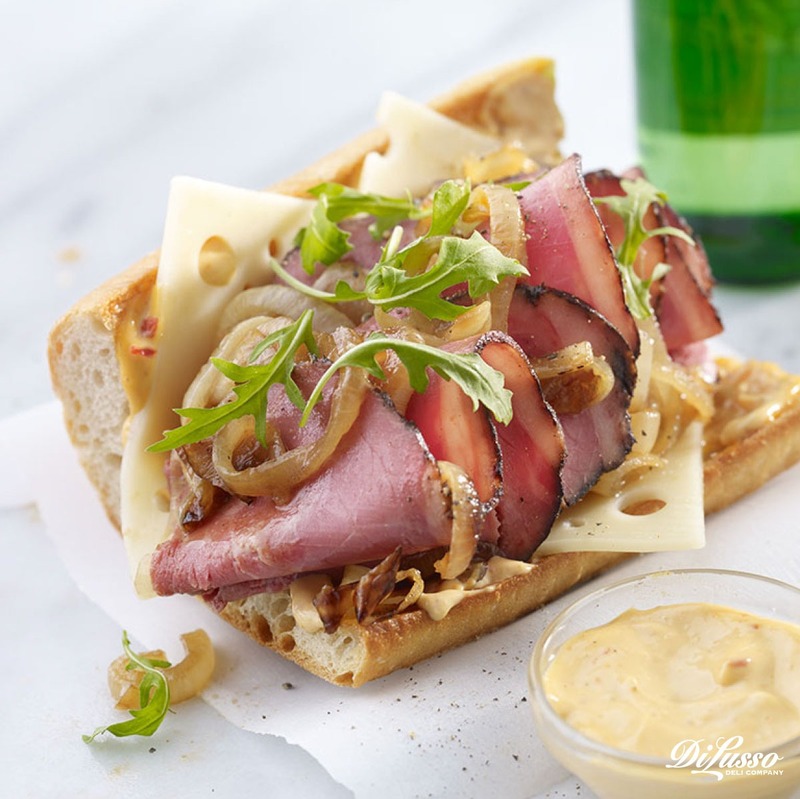 And these tasty Irish Mini Reuben Sandwiches are one of our favorite ways to enjoy it. Despite it’s name, London Broil is not something we got from our friends across the pond. In fact, it’s not even served there. Though the entomology is unknown, London Broil is actually a North American dish believed to have made it’s first appearance in Philadelphia back in 1931. American butchers may call a variety of meat cuts London Broil – flank steak, top round, top blade. But London Broil is more about the way it’s cooked and sliced than it’s seemingly British moniker. Marinated for several hours, then seared at a high heat in an oven broiler or an outdoor grill, it’s cut across the grain and served in thin, preferably rare, slices. Di Lusso uses top quality beef, seasoned with lemon and garlic, then slow roasted for a truly authentic full flavor. Our London Greens Salad is a beautifully inventive way to enjoy this delicious meat. The colors are gorgeous and each of the flavors play off one another so nicely. It’s both a beautiful dish to share with guests and a satisfying one-dish meal to enjoy with family. The French Dip is another American favorite without any links to it’s namesake origins, other than perhaps the baguette it’s most commonly served on. It’s virtually unknown in France. Two Los Angeles restaurants claim birthrights to the delicious warm roast beef sandwich served with a side of au jus, “with juice.” The stories the restaurateurs claim to have inspired the sandwich are as entertaining as they are juicy. 1. A cook, who while preparing a sandwich for a police officer or fireman, slipped and dropped it into a pan of meat drippings. The sandwich was an immediate hit. 2. A customer who didn’t want any meat drippings to go to waste asked his sandwich be dipped in them. Now that’s conservation at it’s most delicious! 3. A chef dipped a sandwich into a pan of meat drippings after a customer complained about stale bread. Which do you think is the real story behind the scrumptious sandwich? We layered DI LUSSO® Seasoned Italian Style Roast Beef and Swiss Cheese on a toasted baguette with a light brush of garlic butter and pinch of dried rosemary. Served with a steaming cup of au jus with a sprinkle of Herbes de Provence, it’s like heaven on earth. Seasoned roast beef done rare to medium, Cajun, Italian and more. 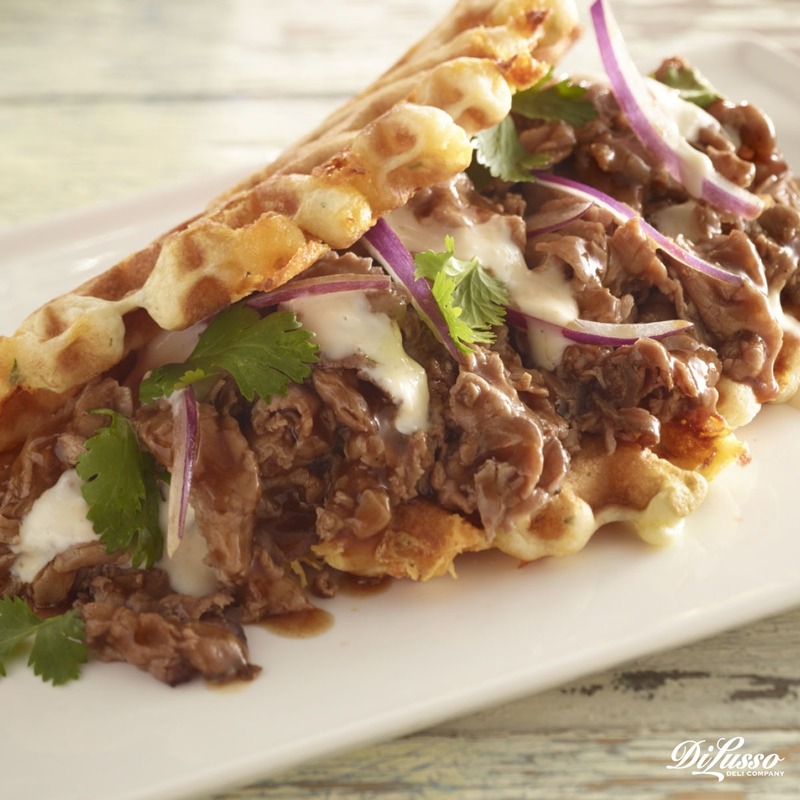 With eight mouth-watering varieties of DI LUSSO® Beef, the possibilities are endless.